According to ESPN's Adam Schefter Jim Harbaugh has agreed to a 5 year deal worth $25 million. This means Harbaugh won't have to move his family and the 49ers got the guy they always wanted. It also means Stanford will be scrambling for a new coach with a more than likely scenario of somebody from Harbaugh's staff getting promoted to head coach. If you are a Michigan fan you knew this was coming. But no worries Michigan loyalists. The University plane was spotted down in Baton Rouge today according to SportsByBrooks.com. Supposedly the plane is owned by Richard Rogel who is a very wealthy and high ranking official at Michigan. Perhaps he was there to talk to Les Miles? Not possible today since LSU is in Dallas getting ready for the Cotton Bowl tonight. But maybe they were there to talk to Miles' agent. I will try to get confirmation from Kirk Herbstreit. He usually nails these things. Right now according to most draft boards A.J Green, Julio Jones, Justin Blackmon, Jonathan Baldwin, and Torrey Smith are ranked ahead of Michael Floyd at the wide receiver position. Most projections have Floyd going late 2nd to 3rd round. In other words: Please God let him stay at Notre Dame for his senior season. 11:54am: The deal is not completely done yet, but it's heading in that direction, according to Jon Paul Morosi of FOX Sports (on Twitter). 11:23am: Fernando Perez is going to the Cubs, according to Miles. The 27-year-old outfielder has a .234/.301/.351 line in 107 big league plate appearances. He hit .223/.280/.299 in 426 plate appearances at Triple-A last year. 10:45am: The Cubs and Rays have agreed to a trade that will send Matt Garza to Chicago, according to Bruce Levine of ESPNChicago.com. Chris Archer, Brandon Guyer, Robinson Chirinos, Hak-Ju Lee and Sam Fuld head to Tampa for Garza, a minor-league pitcher and a minor-league outfielder, Levine reports. 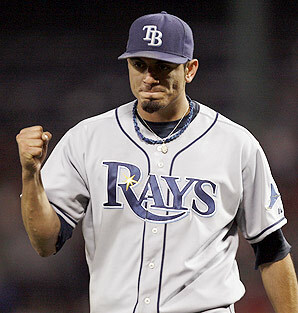 Garza, 27, posted a 3.91 ERA with 6.6 K/9, 2.8 BB/9 and a 35.8% ground ball rate in 204 2/3 innings for the Rays last year. He heads to arbitration for the second time this winter and is set to receive a raise from the $3.35MM salary he earned in 2010. This would be a tremendous pickup for the Cubbies. Garza threw a no-hitter last season for the Rays and I can only imagine how he could dominate the NL Central when it comparison with the AL East. If Carlos Zambrano can rebound from psychoville and be a solid 2/3 along with Ryan Dempster, Randy Wells, and Carlos Silva then the Cubs could legitimately compete for the water downed NL Central. 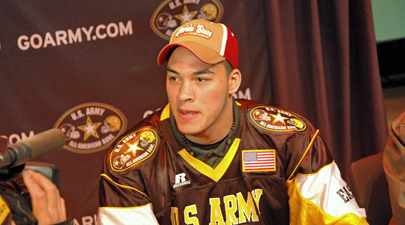 The wonderful world of college football recruiting sprouted another shitbomb today with the news that DE Aaron Lynch will not be early enrolling with FSU after the US Army All-American Game this weekend and instead will visit Notre Dame. Where he was previously committed. Ruh roh. Here is the latest from Tomahawk Nation. - The talented defensive end's mother told Irish Sports Daily that he is re-opening his recruitment will take a visit to Notre Dame this weekend. Lynch was committed to Notre Dame before flipping to Florida State. - Lynch's mother has been quite vocal about her preference for Aaron to attend Notre Dame. I don't believe any report about him de-committing until Aaron, and not his mother, says it. - Lynch has pulled his Facebook page down. - Lynch is still set to enroll at Florida State on Monday. It is believed that he cannot early-enroll at Notre Dame (different academic standards) like he could at Florida State. - I think Lynch turns 18 on February 8th, and am not sure what effect that has on him signing a LOI. - As of Noon Friday, FSU should still be considered the leader for Lynch's services. So according to Irish Sports Daily Lynch will take another official visit to Notre Dame next Friday. This is potentially devastating news for FSU and an absolute steal for Notre Dame if it happens. By all reports from this week's practices Lynch has been one of the best defensive players and has the potential to be a monster in college. He has been practicing as a 3-4 defensive end this week with Notre Dame commit Stephon Tuitt on the other end. Apparently Tuitt has made an impression as his presence has freed up Lynch to pressure the quarterback. On top of that another Notre Dame target in Ishaq Williams (finalists are Syracuse, Penn State, and Notre Dame with Miami lurking) has been tremendous at the outside linebacker position when lined up with Tuitt and Lynch. If all three or even 2 of the 3 wind up at Notre Dame on National Signing Day it would be a tremendous coup for Notre Dame. A lot can change between now and then as the Lynch bombshell proved today.